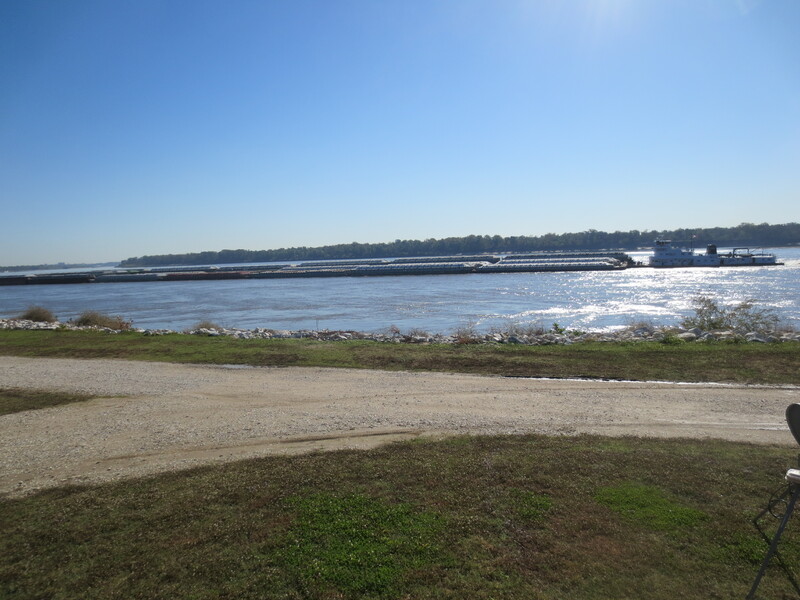 We are now in Sulphur, Louisiana, a suburb of Lake Charles and one of the nicest RV parks we’ve so far stopped in. A + RV Park. A lot of drama going on right now – I guess our dish is kaput; have to replace the system or go in another direction. Have to watch all of our taped shows before everything gets shut down… I keep telling myself – it’s only television shows, but darn it, that’s our evening entertainment!! (and we are hooked on some) Also, our anniversary is Saturday and I have planned a big blow-out for Saturday………….. Time to back off and remember we are supposed to be having fun, so life will be what it is and I’ll just pour another glass of wine and go with it. I had to shop Friday for our anniversary (46 years!) dinner on Saturday, so lots of running around and I knew we wouldn’t get home in time to eat. So, what I came up with was something I just NEVER do!!! I think buffets are the work of the devil, un-sanitary, mediocre food, yaddda yaddda! !BUT, guess I’ll have to negate that ‘never’!! We passed The Grill Pit and didn’t realize until we got inside it was a buffet. For some reason we decided to stay and we just ate our fool heads off. I took one or a spoonful of everything to taste and my plate was really full. Every bit of it was just delicious and good temperatures. My favorites were the crawfish casserole (kind of a corn pudding) and the shrimp beignets!!! Even the greens were good! I was so full, could hardly look over the dessert table, but there sure were some good lookin’ goodies there. Just couldn’t eat another bite!! Add flour until the correct consistency. Dip spoon or scoop in hot water; spoon batter into hot oil and fry. On to Saturday, Nov. 22nd and our anniversary dinner!! Oh my, what a wonderful champagne dinner we enjoyed today!! I’ve been researching jambalayas and gumbos and have found some very interesting customs in this area. Decided to go with a gumbo dinner after learning a most fascinating tidbit – in Louisiana gumbos are traditionally served with potato salad!! And, oh my, are they correct. 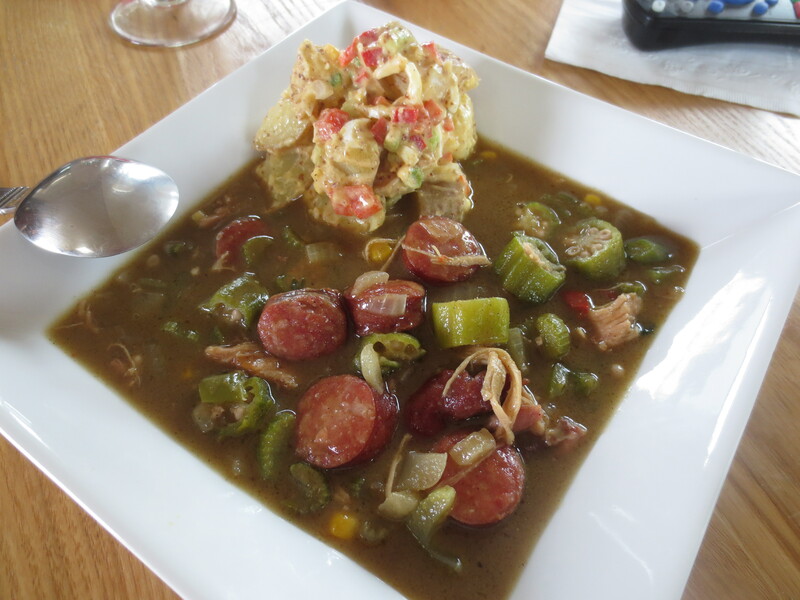 The spicy heat of the gumbo with the spicy coolness of the potato salad was outright wonderful! 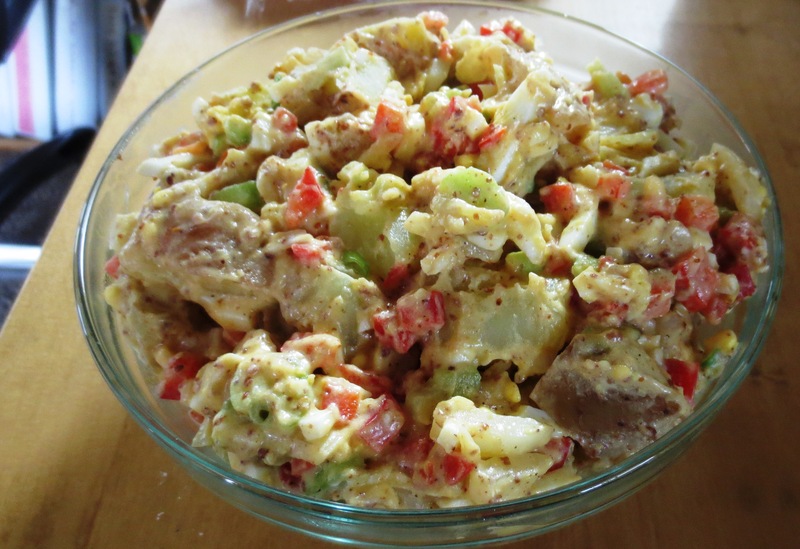 Louisiana Potato Salad – adapted from a Simply Recipes newsletter site. Cook the potatoes until just tender. Hard-cook the eggs. While the eggs and potatoes are cooking, chop the onion, celery, and green pepper. Also, combine the dressing ingredients: the vinegar, sugar, mustard and mayonnaise. Heat 2 tablespoons Crisco in a 4-quart saucepan over medium heat. Add the sausage and cook until well browned, stirring occasionally. Remove the sausage from the saucepan and drain on paper towels. Do not pour off the drippings from the saucepan. Reduce the heat to medium-low. Stir the remaining oil and the flour in the saucepan and cook for 30 minutes or until the flour mixture is dark brown, stirring occasionally. 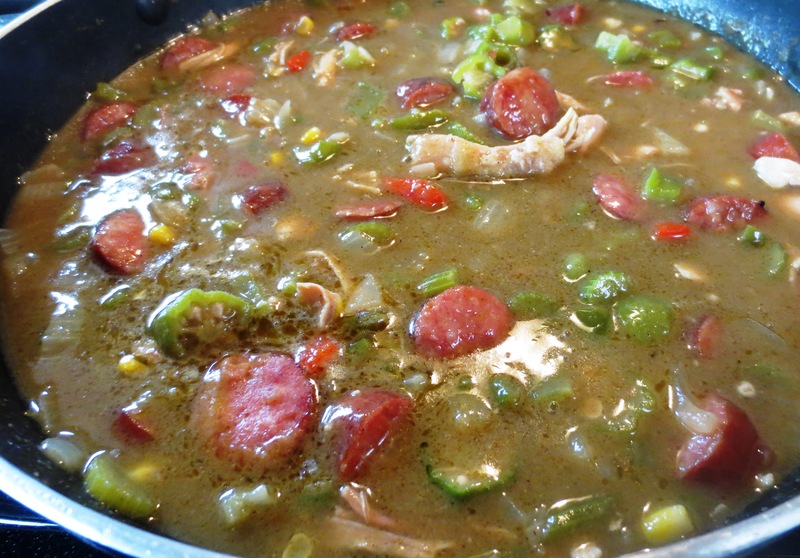 Serve with the potato salad added to bowl of gumbo or as a side dish. 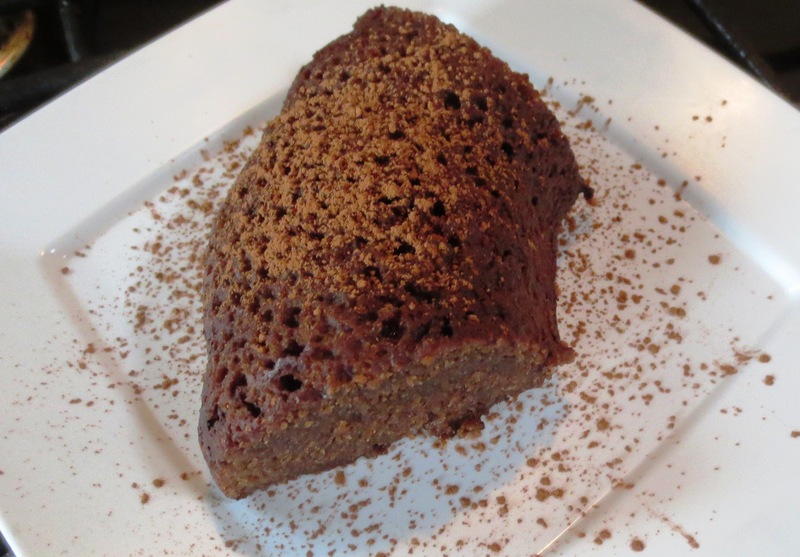 I was so proud of my roux – dark mahogany brown and just so delicious!! Now, I have to cook healthy for a few days or run a marathon!!! We’re staying her for 2 months, so I ought t be able to share some fun dishes over the next few weeks. Happy cooking to us all!! With the temperatures in the low 30s, and being in a travel trailer, the need for warmth is paramount. So, baking takes care of any heating problems. Started the day trying another bread recipe in my quest for ‘our perfect’ sandwich roll – one that will hold up to any filling I use. And, I’m thinking this one is close to it! My oops in making this recipe consisted of using only a quarter of the yeast called for in making 1/2 the original recipe( which called for 2 T.) and I like the texture better for sandwich rolls. They will be sturdier, I think. I will make the recipe again using the called for amount of yeast and see how much, if at all, lighter they can be. No need to shape individual rolls – simply cut dough in each pan into 16 rolls! Quick and easy. Combine 1 cup flour, sugar, undissolved yeast, and salt in a large bowl. Heat milk, water, and butter until very warm (120° to 130°F); stir into flour mixture. Stir in egg and enough remaining flour to make soft dough. Knead on lightly floured surface until smooth and elastic, about 6 to 8 minutes. Cover; let rest on floured surface 20 minutes. 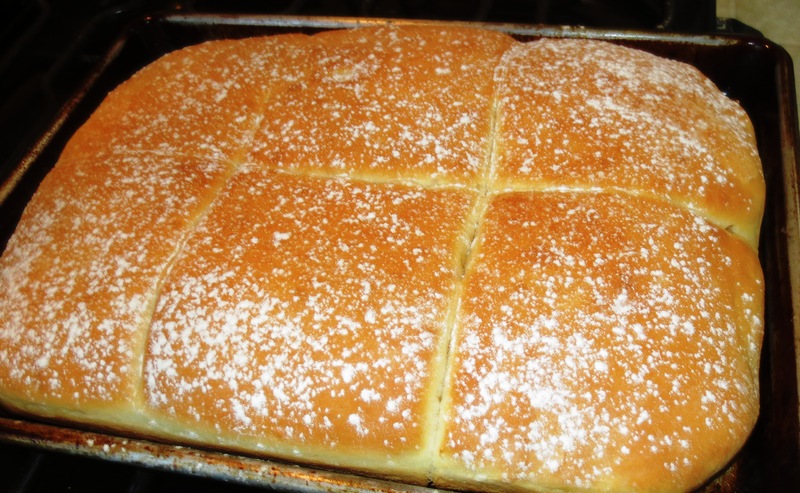 Roll to fit a greased 8 or 9-inch square pan. (I used an 8X12” 1/4-sheet pan) With sharp knife, cut dough into 16 rolls; cover. (I cut into 6 pieces for sandwich rolls) Place large shallow pan on counter; half fill with boiling water. Set wire rack over pan; place baking pan on rack. Let rise 20 minutes. Roy brought home 4 beautifully dressed catfish that I have decided if I want it done right, I’ll do it myself. All I’ve been able to find in restaurants as I move south are ‘strips,’ ‘bites,’ ‘chunks’ or some such clever name that means the fish has just been chopped up! Two went in the freezer and two were used for dinner today. Trying to be a little careful of fat intake, I chose to oven-fry them after marinating in buttermilk, salt, pepper and a little Frank’s hot sauce; then dusting with corn flour. The result was mixed – even sticking the catfish under the broiler for a couple minutes I couldn’t get a nice ‘crust’ on them. 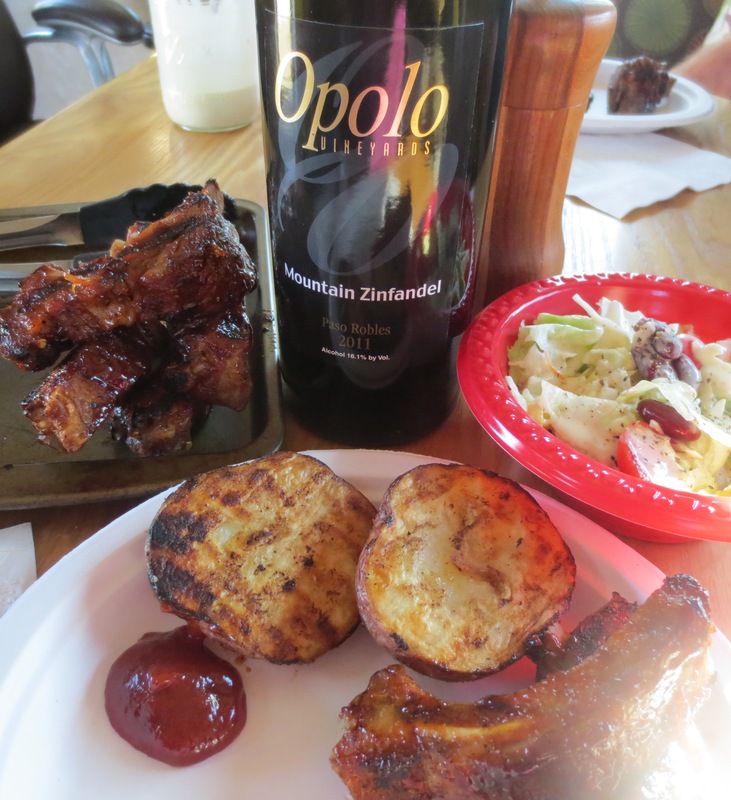 The flavor, though, was wonderful and made for a tasty dinner alongside oven-roasted potato planks and sliced onions. Coleslaw completed the dinner with a dressing I haven’t made for quite a while. The amount of dressing will coat 8 to 10 oz. slaw mix. In a large heavy plastic bag combine the buttermilk, salt, pepper and hot sauce. Rinse catfish with cold water and pat dry. Make 2 diagonal cuts in the thickest part around the belly flap area to help the thicker parts of the fish to cook evenly with the thinner tail part. Add the fish to the bag with buttermilk, ‘smooshing’ around to coat all the fish; place bag on a baking sheet and refrigerate for 2 hours. In a heavy frying pan (I prefer to use cast iron), pour enough oil to come 1/2 inch up the sides of the pan. Turn the heat to medium-high. Turn your oven to 200° and lay a cookie sheet inside. Place a wire rack on top of the cookie sheet. While the oil is heating, mix the corn flour or meal and flour together. (Or you can substitute your favorite seasoning instead.) Let the oil reach 350 degrees — a good test is to flick a little of the dry breading into the oil, and if it sizzles at once, you’re good to go. Once the oil is hot, sprinkle the catfish fillets with salt and dredge them into the flour mixture. Shake off the excess and gently lay into the hot oil. Fry until golden brown, about 4 to 6 minutes, depending on how thick the fillet is. Use a metal spatula and gently turn the fish over and cook for another 4 to 6 minutes. Cast iron heats up and stays hot, so monitor the heat as you fry; you may need to lower the heat on the burner at some point. 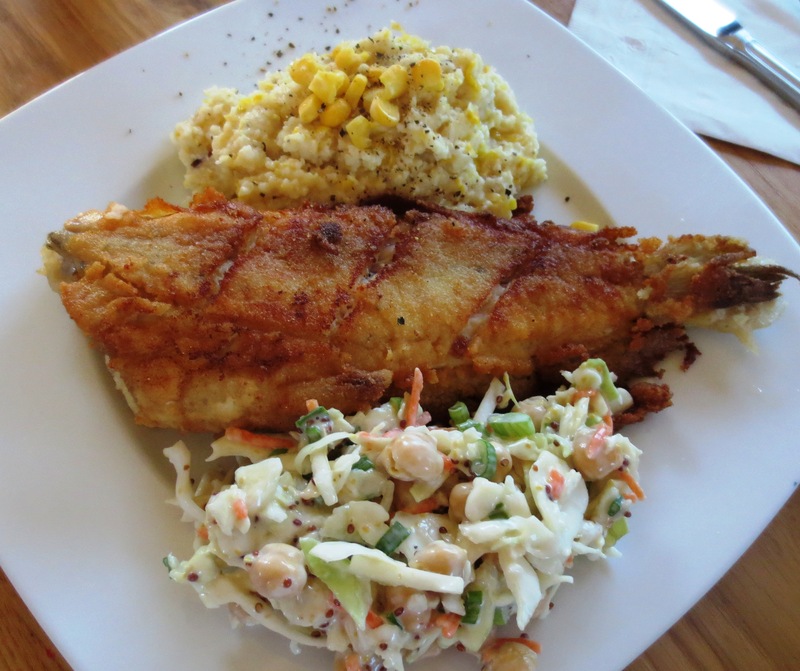 Once the fish is ready, move it to the oven while you cook the rest of the catfish. 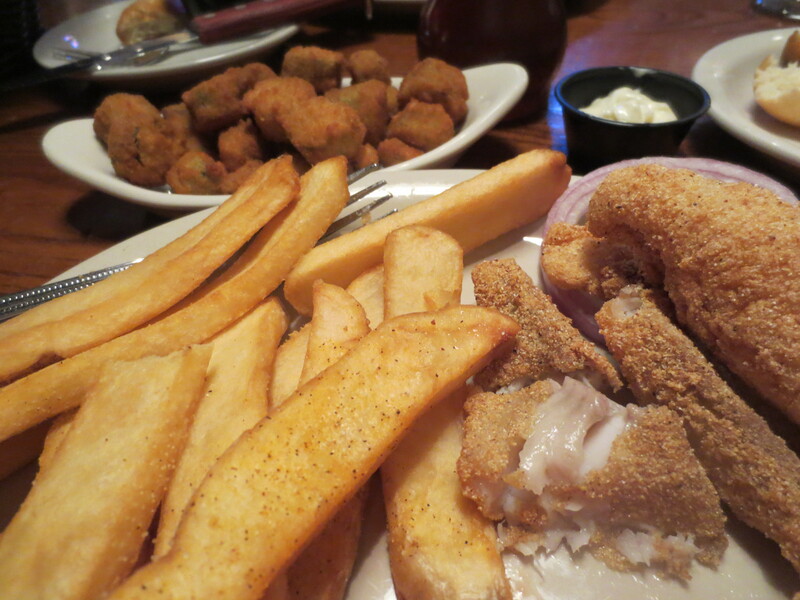 Keeping the fried catfish warm in the oven will help keep it crispy. When they’re all done, serve at once with your favorite hot sauce, cole slaw and some hush puppies or the following Grits dish!! “I decided to citify low-country cuisine by adding lots of chopped garlic and fresh goat cheese,” says Bobby Flay of these hearty yet elegant grits. The end result is a tangy, creamy, corn-flecked side dish. F&W. I made 1/2 the recipe which resulted in my having enough for a little bowl for breakfast….will I offer it to Roy Richard?? No way in……………………. In a medium saucepan, combine the water, milk, butter and 1 teaspoon of salt and bring to a boil. Slowly whisk in the cornmeal. Cook the grits over moderate heat, stirring frequently with a wooden spoon, until thickened and the grains are tender, about 40 minutes. Meanwhile, in a medium skillet, heat the olive oil. Add the onion and cook over moderate heat until softened, about 5 minutes. Add the garlic and corn and cook, stirring occasionally, until the garlic is softened, about 5 minutes. Season with salt and pepper. Transfer the corn mixture to a food processor or blender and puree until the mixture is just smooth. Stir the pureed corn and the goat cheese into the grits, season with salt and pepper and cook just until heated through. Transfer to a bowl and serve. The results for sandwich rolls – these turned out to be too large for individual sandwiches, but were perfect for splitting with a salad. The rolls stand up to any fillings and taste wonderful, also. Will work on size in subsequent batches. 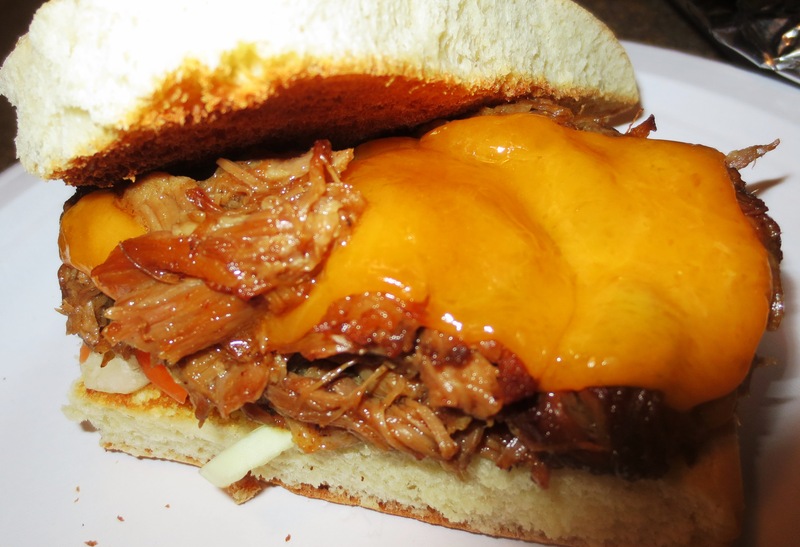 First off tried them with pulled pork – very nice! 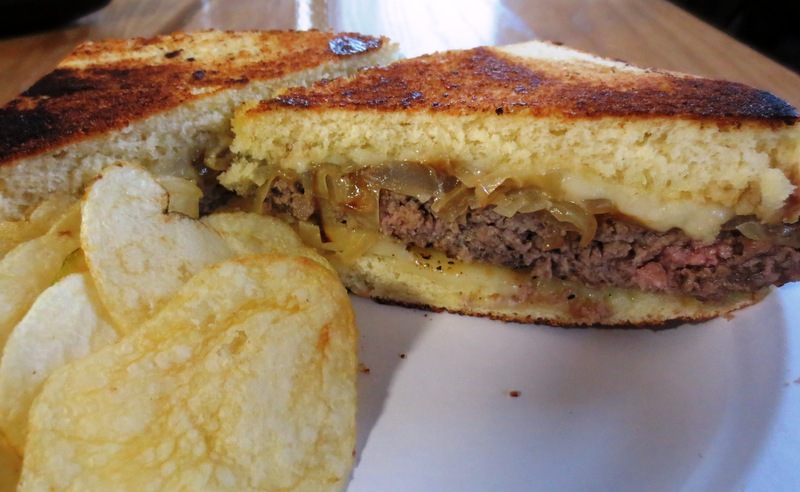 Next day, after finally (with the help of a multitude of friends) I remembered the sandwich I was anxious to make with these rolls – Patty Melt – and, it was everything I’d hoped it would be, even tho it wasn’t with the traditional Rye bread. After the filling Patty Melts m id-day, we were hungry for just had a bowl of tomato soup – but, added a garnish that was super tasty. And, great in the soup if you can keep yourself from nibbling on the chickpeas!!! This is from a link my friend, Alina posted on a forum we both belong to – I didn’t make the soup, only the chickpea garnish and it is so good as a garnish and as a nibbling goodie! Remove from oven and set aside until ready to garnish soup. If made ahead, slightly warm in a microwave or skillet before adding to soup. 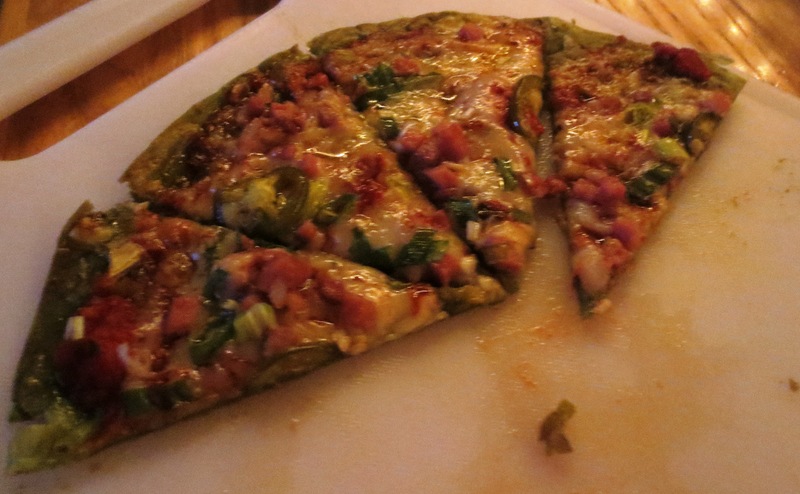 Another side which we love with a bowl of soup is a Tortilla Pizza – we had this simple one earlier this week and I hurriedly wrote down what I had down to be able to duplicate again. Bake at 375 for 8 to 10 minutes. 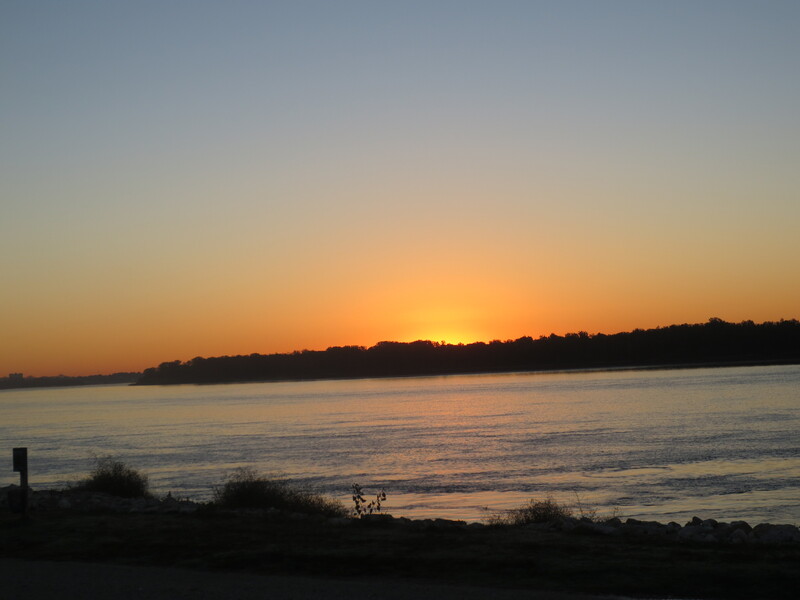 This ends my Mississippi cooking – we have leftovers to see us through a few days until we get settled in Louisiana! We didn’t do as much touring as I thought we would do here, but we sure did try a lot of local favorites and that’s what it is all about for me!! I must warn that this blog turned out longer than I initially planned, but there were so many ideas and recipes I wanted to share – just had to keep going. Sawmill Gravy – had never heard of this, but evidently it is milk gravy as I know it, but would love to try it. 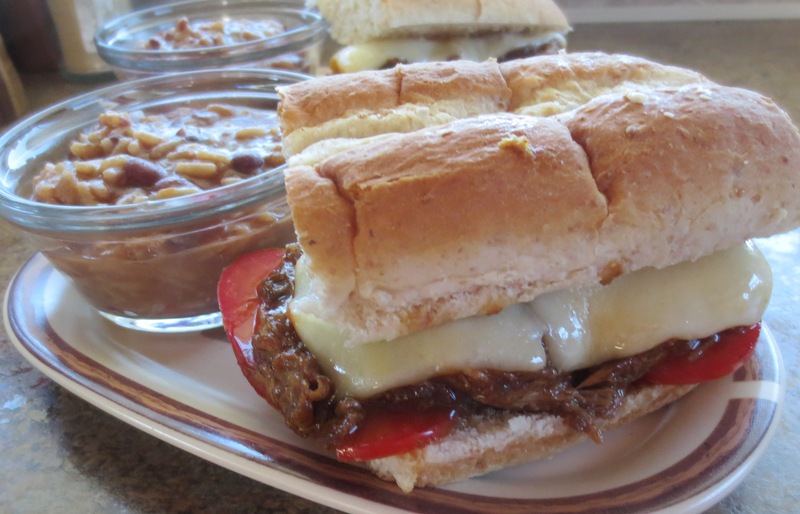 And, of course we’re getting into Po’Boy country……………. While I was gathering ingredients and my thoughts, I ran across this dish from Noble Pig – Cathy Pollak’s blog, and it sounded so tasty I had to make it first night here. This is a winner for sure!! I’d give it at least a 12 (out of 1 to 10). 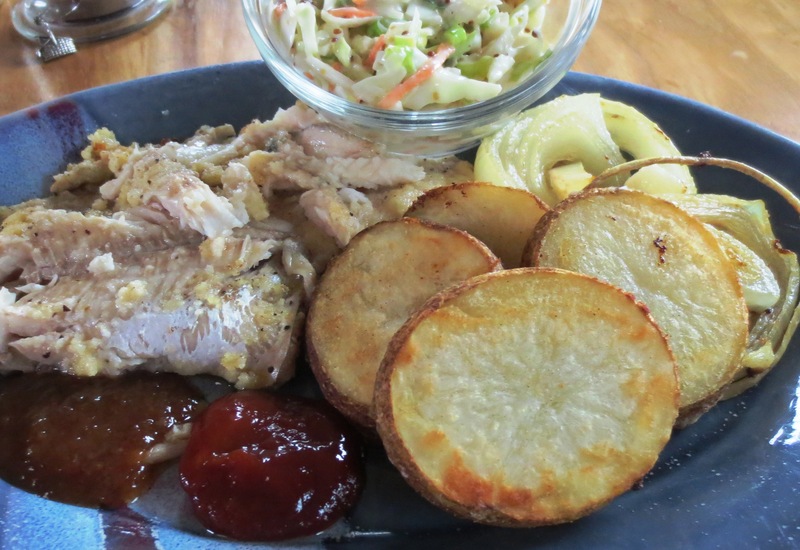 Here is a link to the original recipe but, I have adapted the brining method to the easy one that I use. 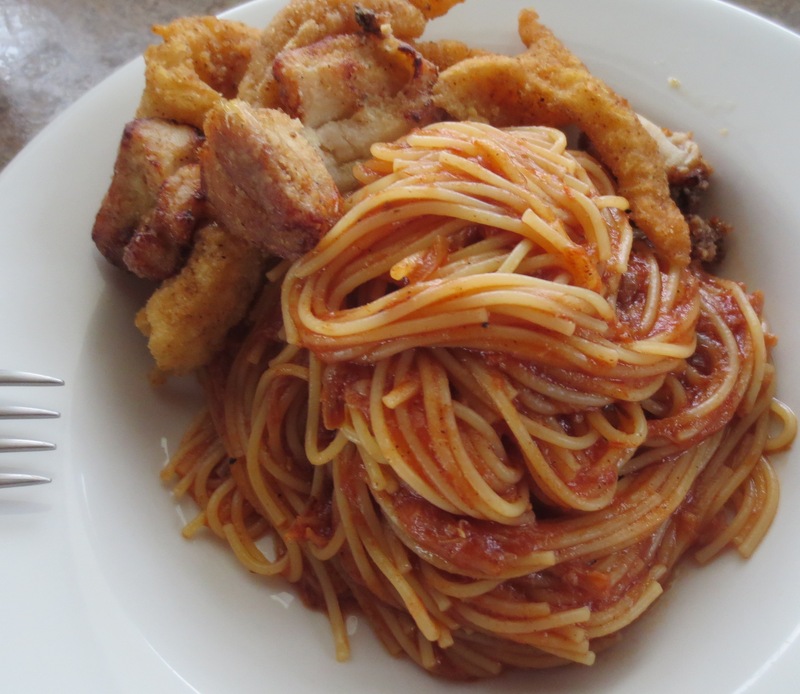 The recipe looks time consuming but 90% is hands off – so very easy. We loved the flavor – the soy and vinegar cut the sweetness of the Hoisin while leaving a strong mellow (is that contradictory??) flavor to the chicken. Whisk all the brining ingredients together until the salt and sugars are dissolved – don’t worry if there are a few grains not dissolved; add drumsticks, making sure all are submerged. Put the chicken in the refrigerator for 3 to 4 hours. Preheat oven to 400°F. Cover a large rimmed baking tray with aluminum foil and set a rack on top, spraying with cooking spray. 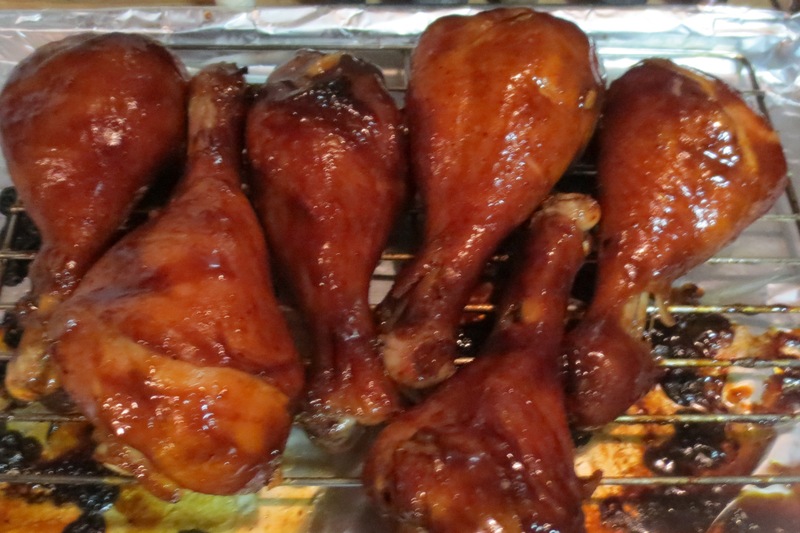 Place drumsticks on rack, wiping off any excess garlic back into the marinade/glaze (garlic tends to burn in the oven). Reserve sauce. Bake chicken in the oven 40 minutes on each side (a total of 80 minutes), turning over once. (I turned mine over after 25 minutes and my drumsticks were done in 55-60 minutes.) While chicken is cooking, add marinade/glaze to a sauce pan and bring to a boil. Reduce heat and simmer until thickened, about 10-12 minutes. Red Beans & Rice – Any RVers out there (or just for a fast, easy dinner) – There is a great pkg’d dinner mix I tried that is so flavorful, it’s like it was made from scratch! 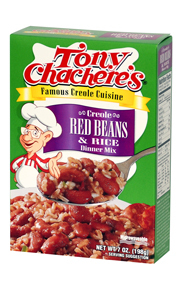 I’m having a devil of a time finding Tony Chachere’s Creole seasoning, but as I check stores I am running into his products. Picked up Creole Red Beans and Rice Dinner Mix and wow, it is so good. It’s just ridiculous to think of having all the ingredients/seasonings in my trailer and this one solves the problem. If you’re on the road anyone, this is one to try. Great with a pulled pork sandwich. 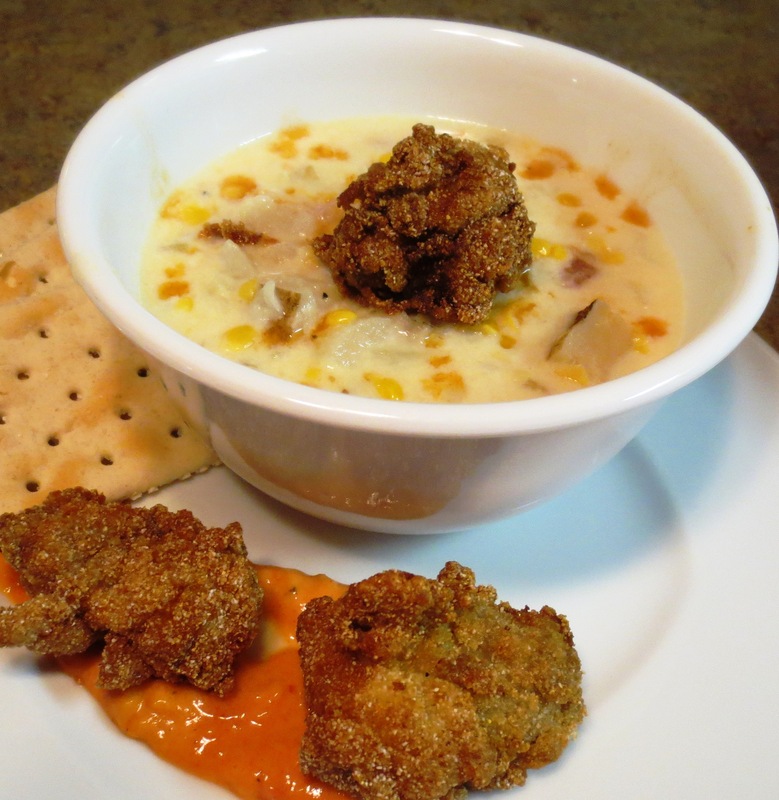 One of my favorite food combinations (and I have no idea why) is Fried Oysters – with Corn Chowder. And, my chowder has to be drizzled with Tabasco only, no other hot sauce will do for me for the flavor. From “Black Bens & Corn” a Chef’s Journey cookbook. Whatever you add to this chowder, it is delicious! Melt butter and add celery and onions; sauté until transparent. Add remaining ingredients except the clams. Cook over low heat until potatoes are tender, 20 to 30 minutes. Add drained clams and just heat through. 6-8 servings. Cook 4 slices of bacon and chop coarsely. In the same skillet with the bacon grease, add 1/2 lb. medium sea scallops, season with salt & pepper and cook over moderately high heat until browned, about 1 1/2 minutes. Ladle the Corn and Clam Chowder into soup bowls top with the scallops and garnish with the bacon and chopped chives. Substitute 1/2 lb. salmon, cut in bite-size pieces for the clams; add to the soup (after the potatoes are tender) along with 2 tsps. lemon zest, cook until just cooked through, 3 to 4 minutes. 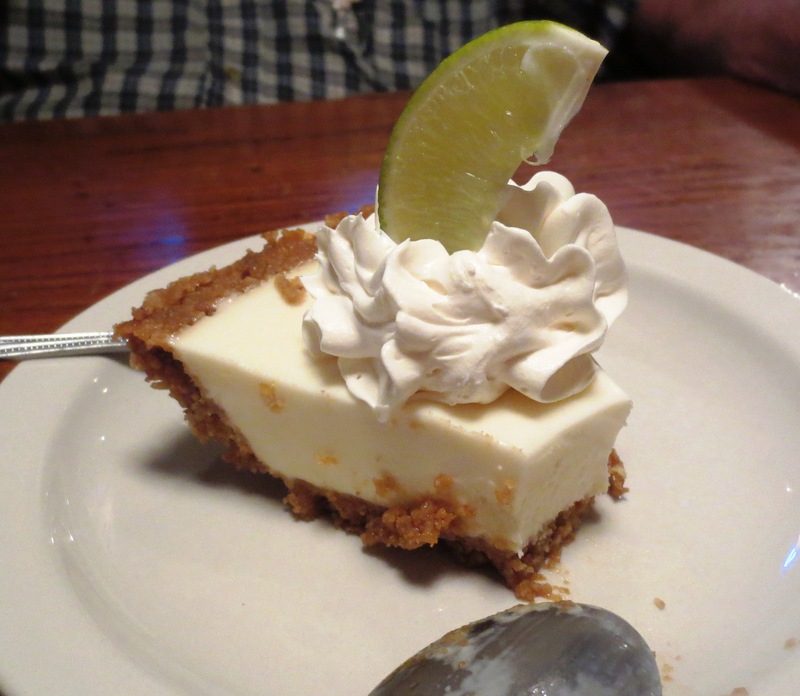 Now here’s a dessert to add to your list of easy and delicious favorites! 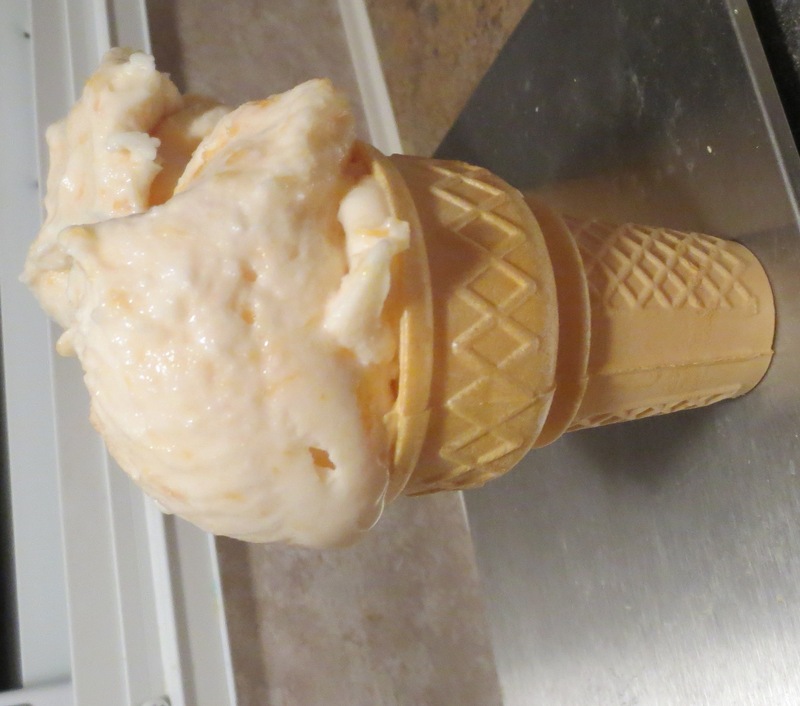 Stretching it a little, but we are heading south – Candied Jalapeno Peach Ice Cream. 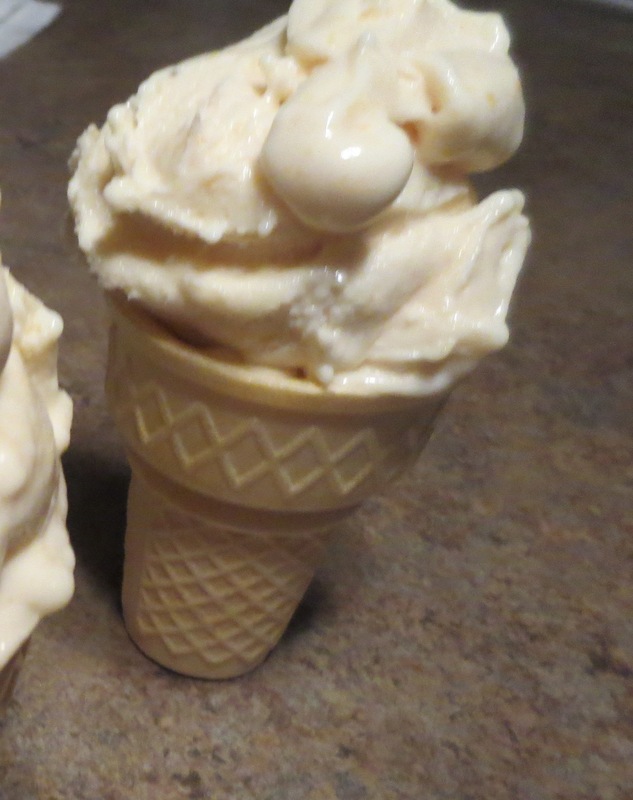 One of the best combinations so far in this continuing fascination with flavoring our ice cream. At the farmers market in Vicksburg, I ran across Candied Jalapeno peppers at one of the stalls – it hit me immediately, Why have I not done this???? Brought a jar home and we have been adding a little of the peppers and/or just the ‘syrup’ to everything!! For dessert, I use 6 oz. of ice cream or frozen yogurt for our treats and this is the amount I use for combining with jams/jellies/sauces/and now candied jalapenos. To the ice cream, I added 2-3 T. peach jam and approximately 1 tsp. of the jalapeno syrup and used a mixer to combine. We think this is the best combination to date. I have found a number of recipes online for making the jalapenos and this one is the closest to the ingredients that are listed on the jar. 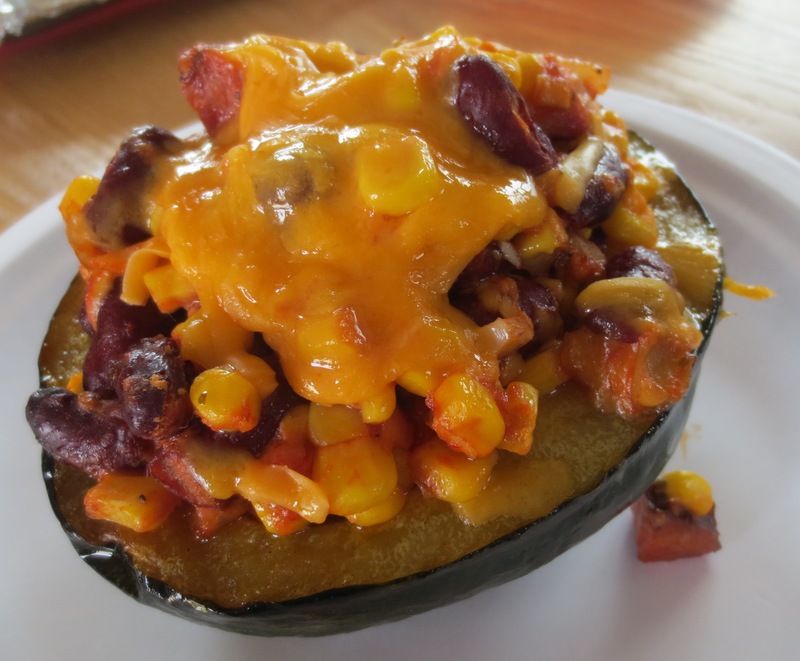 I have not tried this recipe yet, but it is on the list! Turnip greens – had for the first time and I’m certainly hooked – now, to cook them for myself. Black-eyed peas – have used them for years, but in conjunction with stews and soups and such. I’ve never just had a dish of the beans themselves as a side. I love them! Over the years, I have taken these silly quizzes of say, “How many of these foods have you eaten?” which usually offer exotic dishes and adventurous foods and I can answer yes to almost all of them. But, for everyday local foods, I sure wouldn’t be able to; so I’m having fun tasting everything our country has to offer. Mississippi Breakfast Casserole – the usual ingredients for a strata, but somehow this one is a little tastier and I can’t figure out why!! (one thing – no mustard, which I normally add to a strata might mute the fresher, vibrant flavors???? ) interesting idea. The only thing I’d do differently is using the sausage as patties makes it difficult to eat (but, it is prettier) – I’d just scatter the broken up sausage as a layer. 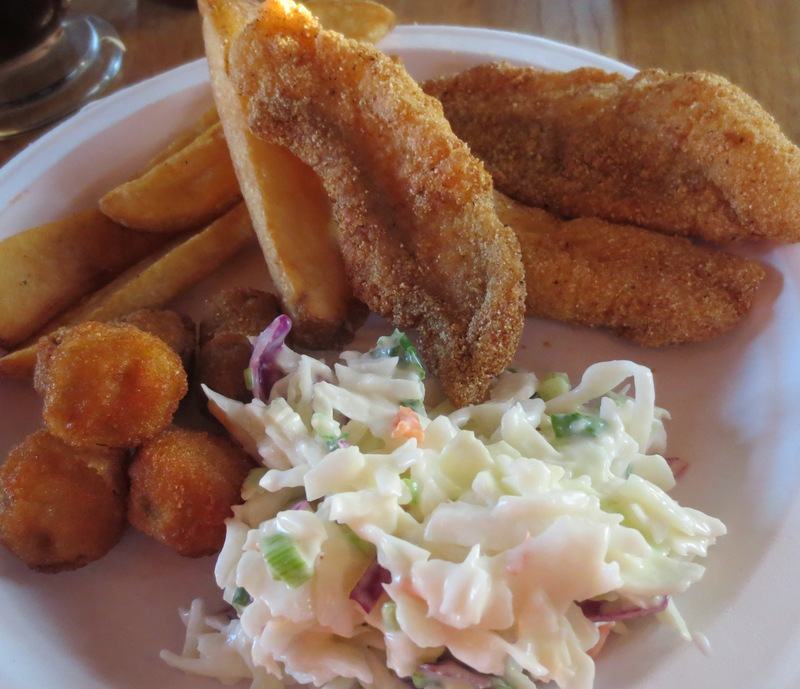 Just a quick note about Catfish Po’Boys – if you have catfish you’ve brought home from a restaurant and IF you also have Remoulade sauce and a fresh sandwich bun, you are all set for a delicious and easy Catfish Po’Boy Sandwich! And, lastly for this week of cooking – WOW, we’re ending with a real bang for your buck! 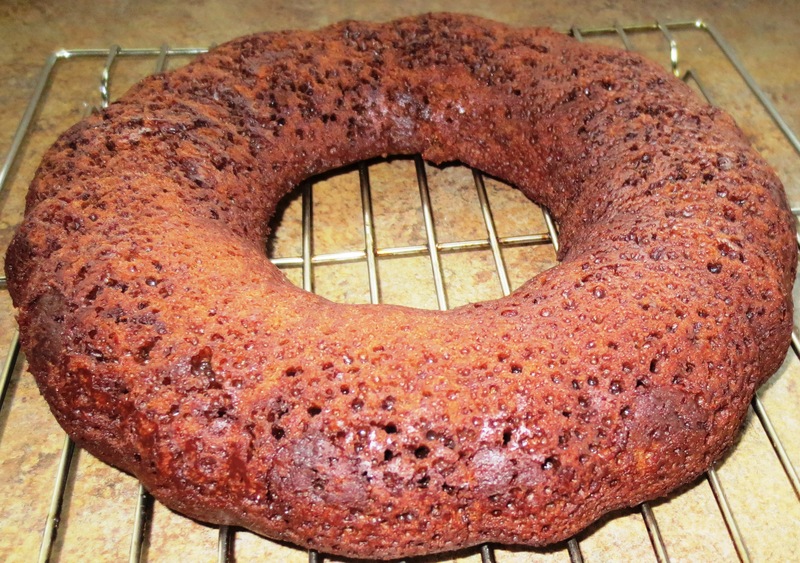 Because there are only the two of us and we try to limit ourselves In what & how much we eat (I know it doesn’t sound like it, but we do – usually), I cut this cake recipe in half and made a mini-Bundt cake. Cutest little thing; I’d never thought of doing this before but it’s certainly the way for me to go. 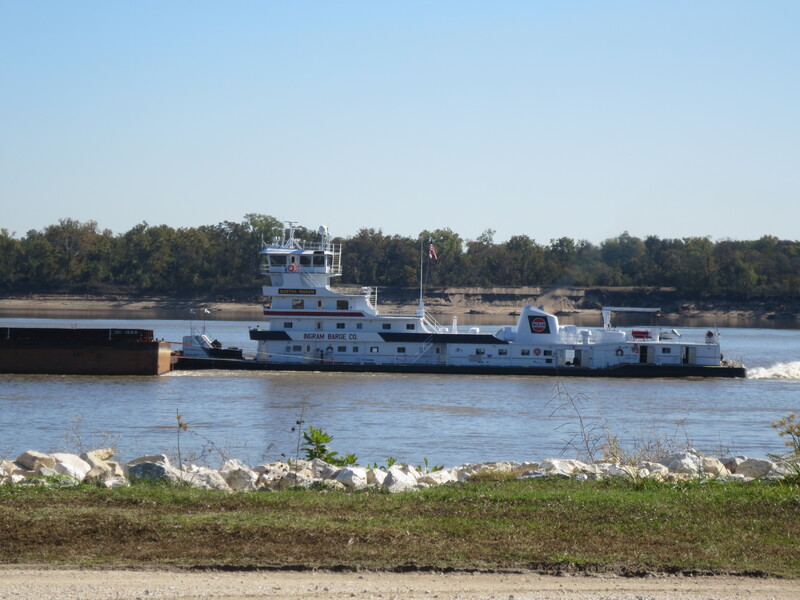 We have 5 more days in Vicksburg, but in addition another couple weeks in Lake Charles area, I may be able to do the remaining projects I’d like to do – myself rather than paying too much money in a restaurant when I can do it the way I want! Buy and cook my own bone-in catfish!! That’s all for now – I hope you all made it through all of this! !